Hey, do you remember when I found that bar cart at an estate sale for ten bucks and had my husband stand there with his hand on it—like those Keep Your Hand On The Car competitions they used to have at state fairs, except with fewer deep-fried Twinkies—so that I could run and find someone to give me a price on it before another bargain hunter bought it first? And then I took it home and put it on my front porch like the classy broad that I am and took a picture of it to show you that it looked like this? Yay, gold! I love gooooooooold. This is what I think every time I see this bar cart—to save you from clicking on that link, I will tell you that this is a line from Austin Powers 3, which is so much less excellent than Austin Powers 1 and even Austin Powers 2 that it's laughable—and that is because I have made this bar cart way, way golder than it was before. Now, I know quite a few of you told me to keep the wood intact and not paint it, and this is fully what I intended to do, I swear. Once I'd cleaned it up, I kept it in my living room just as it was for a good two months, until one day I realized that I wanted to do more. I liked it, but I didn't love it. Much as I wanted to keep the original finishes, they weren't in particularly great shape, and the whole thing didn't quite look as chic as I'd envisioned. Has potential, but could try harder. Please see me after class. And so I began a weeks-long trial and error experiment with this stupid bar cart that almost made me wish Sean had taken his hand off it that day so that someone else could have snapped it up and I wouldn't be making my third consecutive trip to Michaels—excuse me, Effing Michaels as we now call it in this family, after a particularly painful bout of wedding crafting a few years ago—on the offchance that they might have suddenly stocked up on more brass spray paint. My original plan had been to leave all the wood parts wood and the chrome parts chrome, then paint the sides gold and the trays—formerly a weird plasticky wood veneer—a bright white. But I tried that, and it looked super 70s, and I don't mean a "wow, I'm going to buy that on Etsy!" sort of 70s, but more of a "huh, I think my parents had that in their basement" sort of 70s. Then I tried changing the panels from gold to white, but that just made it look like I'd picked it out of the catalog at IKEA, a design aesthetic I already have quite enough of in my house, thank you very much. So then I decided that the problem was the chrome—not my favorite, as they say in the South when they want to throw something off a bridge with ankle weights strapped to it with duct tape—and, on a whim, I spraypainted the chrome a matte goldy-brass, which immediately made me love the whole thing a lot more. Once I'd done that, I was positively cavalier about going the whole hog and painting the horizontal wooden edges the same goldy-brass; as you can see from that first picture, they weren't really in the greatest shape. The handles were, however, so I left them as their original wood and just stained them a deep espresso; they're now lovely and shiny, and you can still see the wood grain. 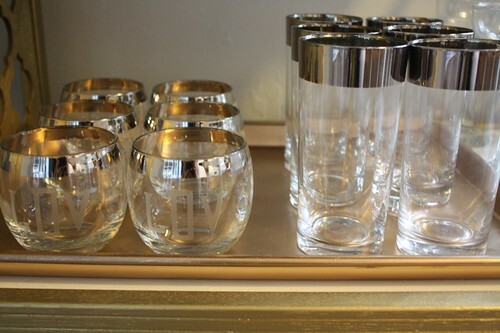 After that, it was just a case of putting everything back on the shelves, including the set of six pewter-rimmed scotch glasses for which I searched high and low over the period of a year—they're monogrammed LDV because I got them at a flea market, but I like to pretend it just stands for Lo, Delightful Victory!—and the matching set of highball glasses I found irritatingly easily in a San Diego Home Goods over the recent Christmas break. I wanted a few trays to keep the glasses and bottles together, but I couldn't find anything I liked enough to justify spending money on, so instead I just spray-painted some old baking sheets a slightly different shade of gold and used those. When I get sick of them being that color, I'll just take them into the back yard and give them a few coats of whatever spray paint I happen to have left over from something else. I know it's not the most exciting thing I've ever done, and maybe all that gold is not to your taste—if it were up to me, everything in my house would be gold, but in a low-key, tasteful way, not in an Adrienne Maloof way—but I really love my sweet little bar cart, and for a grand total of $20 (ten for the cart, and ten-ish for the spray paint), it was a pretty affordable project. Plus now I have somewhere to put that bottle of Veuve Cliquot—which the very generous Mai brought over on New Year's Eve—while I wait several years for an occasion special enough to open it. College graduation of my non-existent, unborn child? Yeah, that should do it. We don't waste fancy around here. It's beautiful! I love the gold, and I think it looks way classier now than it did before. Good job! Love the cart, love the gold. Just perfect! It looks perfect! I, too, love gold. I always feel sort of tacky saying this, since I know most people prefer silver, but I can't help it! Ok. So. The only thing better than hot pink is gold. Excellent. Bravo. Cheerio! I love this. I especially love the spraypainted baking trays. 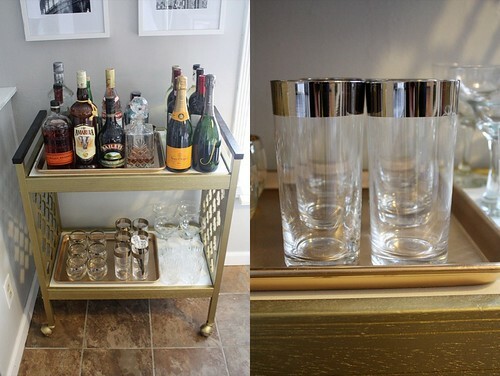 We've been really wanting a bar cart recently. I must finally be 34 because all your home decorating posts make me want to move and buy a house and lovingly decorate it(after I win the lottery). Holly, that's beautiful. But what's cracking me up right now is that JUST YESTERDAY I announced that someone "is not my favorite," and that is EXACTLY what I meant. You are so right: that is extremely Southern. I'm not a big fan of gold in general, but holy cow I love that! 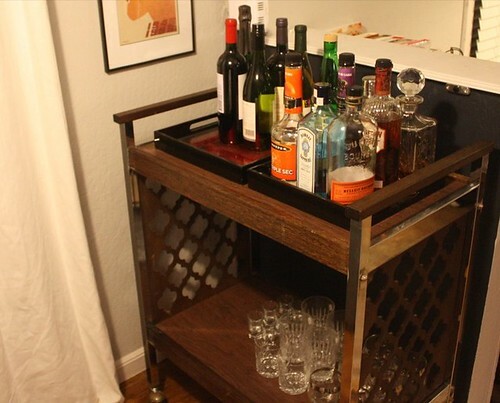 It's so fun and makes me want my own bar cart. And a drink. Can you just come over and decorate my entire apartment, please? LDV makes me think La Dolce Vita, but your interpretation works too. I sometimes have a hard time seeing the potential in things and when you first showed a picture of that bar cart I didn't really understand why you wanted it. Now however, it looks fabulous and I want one just like it! Lovely job!! I must say I was skeptical when you bought that at the garage sale. It reminded me of the TV stand we had in our family room growing up. I thought you had finally made a bad design choice. Lo and behold, you have redeemed yourself with this golden creation. All hail, Holly the queen of decorating! The estate sale blog entry was probably the first I read when I stumbled across your blog. Now I'm hooked. Soo glad to see you did something with the cart! 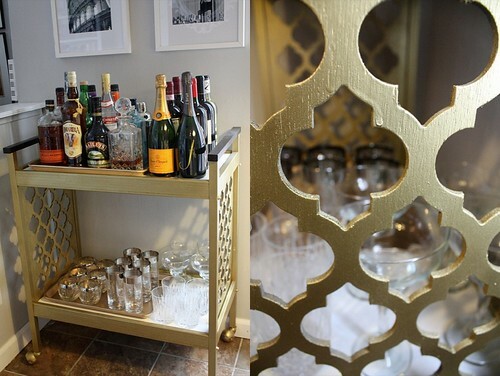 I'm now on a search of my own for a crazy awesome bar cart! Okay, okay, the gold looks bloody awesome. I would have said keep the wood, but yes, the gold is so much better. It looks fabulous! The gold is just the perfect thing for it. Looks wonderful in gold! And I love, love Amarula! Love it! Gold is such an upgrade. Dawn, I did try it that way -- it seemed a little more intuitive to me too, honestly -- but it really didn't look that great. The bulk of the liquor bottles sort of blocked out the lovely cutout shapes, and the impact wasn't as cool. Sort of annoying, because I agree it seems that the liquor should go on the bottom, but it just didn't....work. Thank you for the suggestion, though -- not a critique at all! It looks great. Am glad you went with gold. I totally wasted a bottle of the fancy champagne. I think I was celebrating a Friday! PS. Kirsten - Cheerio means goodbye, over here in England. I don't think it's used much except maybe by the ra ra rugby types! Today is my first free and clear-of-any commitments Saturday since September (yes, September) and this has inspired me to spend a few hours at (effing) Michael's. Holly, you're an absolute DIY genius. I love how you've managed to make gold - the tacky, in-your-face tone that it so often is - look refined and subdued and full-on fabulous. So, how about if I go thrifting and buy a whole bunch of potentially-tacky 1970s pieces and then you come over and transform them into works of awesomeness? So chic, I'm glad you went whole hog on the gold paint. And, we say "not my favorite" in Minnesota, too. Minnesotans are not so much NICE as we are passive-aggressive. You are so damn crafty, it's maddening. LOVE the gold. I, too, love all things gold, and the glasses are such a great touch. Also, the baking sheets! Ingenious! I wish I had your motivation with such projects. It is very hard to get the right kind of gold paint without it looking tacky but I think you were spot on - very chic. I've also been looking for that set of scotch glasses for years. They're the ones Don Draper has in his office on Mad Men. They're called Dorothy Thorpe roly poly glasses and they're always $ on ebay, so I'm so jealous you found yours at a flea market. The entire post, all I could think was "Hey! Holly has the same Mad Men roly poly glasses I do!" And then at the end I saw a closeup and realized that yours are etched with something, whereas mine are plain. However. Still. Very cool. Maybe some encouragement to drink your bottle of Veuve sooner, but we opened a two year old bottle this NYE and it had a weird taste to it. Probably a freak thing, but maybe you should drink it tonight for the premiere of downton abbey. Ha! Leigh, I like the way you think. 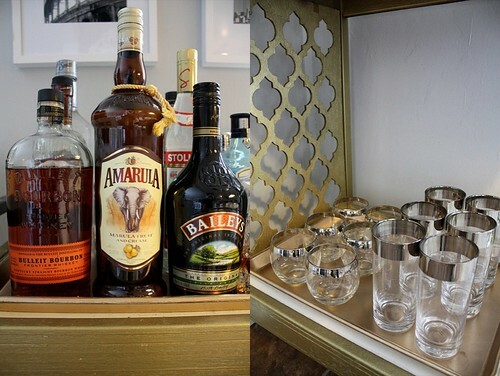 I really like your bar cart but, FOR THE LOVE OF GOD, don't store your booze out in the light! Girl. Veuve only costs between $40 - $60 a bottle depending on where you live. Drink it.